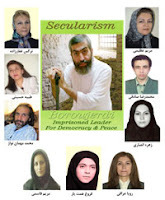 According to the report of “Human Rights and Democracy in Iran”, ten supporters of Kazemaini Boroujerdi’ who had been summoned to Special Clerical Court, were summoned to court again via telephone on April 9 and 11. According to the summons, Roya Araghi, Mariam Azimi, Tayebeh Hosseini, Narges. Ghaffarzadeh, Zahra Abdullah Vand, Zohreh Sharif, Maryam Ghasemi and two men named Mohammed Reza Sadeghi and Mohamad Mehmannavaz were summoned for a second time during within one month, and required to appear on April 30, 2012 at the Special Clerical Court in Tehran on Zafaraanieh street. It should be mentioned that mounting pressure on Mr. Boroujerdi’s supports is aimed at forcing him to compromise with the regime and come short of his demands in defense of freedom, democracy and human rights. Notably, since November 2010, the pressure of threats and harassment of the government and the ministry intelligence and security for Mr. Boroujerdi and his family have greatly increased. On various occasions, the current regime of Velayat-e Faqih has used inhumane methods in order to cause physical harm and eliminate this secular cleric and supreme leader in prison. Likewise, his supporters fear for their safety. Recently, a few days before the Iranian New Year, the regime attempted to assassinate Mr. Boroujerdi in prison by poisoning him. As a result of his poisoning by the regime, he is still suffering from internal chronic bleeding. Despite calls from his family and human rights activist, Mr. Boroujerdi has not been treated by physician and throughout the New Year holidays he has been in the same condition and without any sick leave. Supreme Leader Ali Khamenei has continued the policy of eliminating progressive and secular clergy and their supporters through the Special Court of Clergy. The regime has appointed as Mohammad Salimi as the special prosecutor in charge of Human Rights and Democracy Activists in Iran condemn the actions of the Iranian regime’s act of pressuring and summoning the supporters of Mr. Boroujerdi to appear at the Special Court for the Clergy whose members are appointed by the Supreme Leader, Ali Khamaeni and requests that the High Commissioner for Human Rights and other international bodies to act and end oppression in Iran.